The tranquil country-styled Farmstall situated on the Garden Route 5 km from the picturesque coastal town of Stilbaai, offers the best jams and chutney in the world! The Sweet Mustard has an unequalled taste of delight, while the Boeremeisies (Apricots in Witblits) will bring back memories from days gone by. Who doesn’t love Vetkoek on a winters day? Try our Catawba Jam which pairs well with Vetkoek. It is a first in Stilbaai! Come on, winter’s calling. 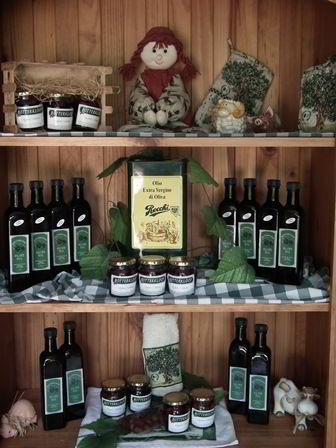 The Farmstall is also the only location along the Garden Route at which you will be able to buy the unique Botterkloof Extra Virgin Olive Oil. The oil is ideal for cooking and is blended with Coranata, Calamata, Mission, Manzanilla, Frontoio and Lechino Olives. The Farmstall stocks a different variety of delicacies, which includes: Pears in Red Wine; Quince Jam; Apple Chutney; Grape Jam; Rusk; Ice Cream; Farmers Soap; Cool Drink; Juice and Wood. Nothing is more authentic and unique than hand-made products. We also stock Ouma Hanna hand-made soap – the ideal treat for your loved-ones back home. The newest addition for the Farmstall is meat products at the best prices! We have Biltong and Droewors at the BEST price in Stilbaai. Our restaurant stocks a large selection of wines and serves the best local meals and cake in the country. The WINE STORE is in full operation and we sell Gin; Wine (large selection of red-; white- and sparkling wine); Beer and wine accessories. We invite you to come and share good memories at Botterkloof! This extra virgin oil is blended from Coranata, Calamata, Mission, Manzanilla, Frontoio and Lechino Olives and bottled right here on our Estate. This is the first school in the early 1900s that is build by the farmers of Stilbaai district. Especially Cronje and Kleinhans families have contributed a lot to this effort. The building was build out of chopped sand stone blocks and farmers of each district have contributed a number of blocks. They later build a house for the principal near the national road. With the build of Bertie Barnard the BOTTERKLOOF SCHOOL taken over by the NG missionary church and the learners were mainly of Melkhoutfontein and farm workers of the district. Both the school and the principal's house were used for about 150 children's teaching. The staff was a principal and six teachers. Melkhoutfontein's school was built but for years there were two colored schools because of a feud between NG missionary Church and Anglican churches control boards. With the new political dispensation and better facilities, the two schools joined in 2006. The current owners Gert and Elsa Kruger is very conservation conscious and is the school as preserved and converted into homes/chalets. The buildings are preserved with minimal changes inside and can be visited by appointment. Botterkloof farm got its name from an incident when a farmer in the early 19th century on his way to Riversdale with a wagon with barrels of butter. In the gulf at the old homestead did the wagon crashed and hence the name Botterkloof. The road between Riversdale and Still Bay was right before the old homestead. A Jewish couple in 1930 occupied the house and planted vegetables and sells from the old garage- hence the name Jewish Huysie. Gert and Elsa Kruger combined the old homestead with the barn, but the inside and outside of the Jewish Huysie are beautifully preserved and today it is a Deli and farmstall where delicious smoked meats and other delicacies are sold. Olive oil and table olives grown on Botterkloof is stored in the Jewish Huysie and can be tasted. Copyright © 2013 Botterkloof. All Rights Reserved.